For women who find themselves constantly removing body hair in one way or another, a shave minimizing lotion holds all kinds of potential. The promise of massaging a skin with a veritable "miracle product" in the hopes of decreasing shaving time almost seems too good to be true, but that has not prevented many companies from marketing the product! In the mid-2000s, popular skin care companies like Jergens, Keri and Aveeno began to spread a new kind of excitement with the introduction of a lotion formulated to reduce the amount of time spent shaving. Not only that, but this product would also inhibit the growth of new hair, softening the hair that grew back, and over time resulting in very fine, barely perceptible hair. The idea was that, over time, hair would cease to grow at all, or at the very least grow so slowly that shaving time would be dramatically reduced. These claims were made thanks to the curious ingredients, which included a hefty dose of hydrators (these act as the so-called hair softeners) and a mild alkaline agent formulated to dissolve the hair. Note that the alkaline found in basic hair removal depilatory creams - those that applied to the skin for a brief period of time before being rinsed off - is quite strong. This alkali can even irritate some skin, but its strength is also what allows it to work so effectively. The same can't be said for so-called shave inhibitors, which, at their best, can really only contain a small amount of any alkaline agent. This is because the product is a lotion, not something meant to be rinsed off after a short period of time. In essence, one should not practically expect this product to really remove any hair, given its very meager quantity of alkaline. On the other hand, because it's so rich in softening ingredients, the lotion may live up to its potential in leaving your hair finer and, thus, easier to remove. Among the many softening ingredients including in the lotion, some standouts include mineral oil, dimethicone and petrolatum. Combined in this heavy lotion, they do leave the skin and hair quite supple. The purveyor of the anti-shave brigade was actually Jergens, which introduced its Naturally Smooth Shave Minimizing Lotion to great fanfare. It, along with the majority of shave minimizing products on the market, has since been discontinued. Though some devotees were disappointed with the decision - the discontinuation of any beloved beauty or personal care product is often a bitter pill to swallow - it doesn't mean that there aren't replacements to be found. Aveeno Positively Smooth Moisturizing Lotion: Aveeno is often considered the gold standard when it comes to skin care products that are safe to use on highly sensitive, eczema- and psoriasis-prone individuals. This particular moisturizer is very lightly fragranced, made with a combination of natural soy, soy extract and a host of skin conditioners. Of course, these are included to leave the hair softer and, Aveeno claims, less noticeable over time. The real benefit, though, is that the skin retains levels of high moisture thanks to these richly hydrating ingredients. Aveeno Positively Smooth Facial Moisturizer: Following suit, the company's facial moisturizer from the same range is formulated to minimize the appearance of facial hair with repeated use. The product is oil-free and noncomedogenic, but it's still wise to conduct a patch test prior to using it all over the face. Nivea Sun-Kissed Beautiful Legs: Whether you want to enhance your golden summer tan or just achieve that look during fall or winter, this product can do the trick, adding a gradual, natural looking glow to the skin. It does work in 24 hours, but darker color is easily achieved with more use. In addition, Nivea states that the product makes hair less noticeable over time, adding that tans last longer when the skin is not shaved as often. 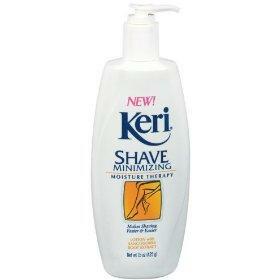 If you were a fan of the Jergens, Keri or any other discontinued hair minimizing product, you can still find them from time to time on eBay. Check back often - sellers will often have them available in bulk quantities at reasonable prices.